23 Christmas Crochet Projects You Need... | Top Crochet Patterns for you to enjoy! Oh the weather outside is frightful… well, not really! It’s a bit cold though, so we’d rather be snuggled up inside under a blanket working on our crochet projects. If you’d like to follow suit, these 23 crochet patterns are the perfect projects to start in the run-up to Christmas – you’ll be able to whip them up in no time to keep for yourself or give as gifts to your loved ones. Bring the Christmas spirit into your home with three crochet trees. Irene Strange’s pretty trio can be added to table décor or dotted around your living space for some festive fun. This design features alternating stripes for the tinsel, and you can take it a step further by introducing buttons, pearls, ribbons and embroidery – anything you think will add a bit more sparkle to your design! Your festive décor won’t be complete without this cute amigurumi snowman, dressed in a brightly-coloured striped hat and scarf. What’s even better is that this design by Christine Harvey incorporates a fun twist on the traditional snowman, in that his body is made up of yellow, pink and blue yarn. It’s a great chance for you to perfect your toy making technique! Heather Gibbs’ gorgeous chirpy robins are made using three simple stitches. 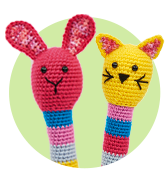 The perfect project for a crochet newbie, this easy amigurumi duo will certainly add a touch of joy to any room in your home. Little ones will also be thoroughly entertained by these sweet companions, so go ahead and get your mitts stuck in! If you’ve ever heard of the tradition of the Swedish Yule goat, then you’ll realise why this quirky make is a hit! Legend has it that Santa would sometimes ride the Yule goat instead of taking his sleigh to deliver gifts. So, take the creative plunge and whip up this adorable goat by Liz Ward. It should take you no more than four to five hours to complete, making it the perfect weekend project. Santa Claus is arguably the Christmas season’s most famous figure, and this lovely little make by Heather Gibbs certainly captures his charm. The sections are worked without joining in continuous rounds, so it can be helpful to place a stitch marker in the top of the first stitch to mark the start of a round. Then, add little spectacles and a shiny belt, and you’re ready to go! We know you love your lights and baubles, but give bunting some love for a change. This stylish snowman-inspired design uses basic double crochet stitches throughout, with treble crochet stitches for the scarves. It is easy to adjust the size by switching to different yarn, but do remember to use a slightly smaller hook than you normally would to keep the fabric neat. The pom-pom trend keeps on flourishing, and what better way to keep the spark alive than by making this wreath? Sarah-Jane Hicks uses winter-coloured yarns with shiny baubles in complementary colours for added effect. Hang from your front door and wait to see how many compliments you get! Any penguin lover in your life will adore this friendly duo by Heather Gibbs. An easy pattern to make, this design is ideal for crochet newbies. Adhere cute safety eyes and a bit of blusher to brighten up their faces. Dot them around the home or under your Christmas tree for a delightful surprise that kids will certainly be joyous over. 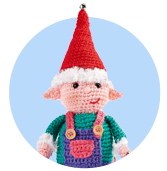 These cheeky crochet elves will be your favourite festive project yet! Impress your loved ones by placing them on your mantelpiece or windowsill and watch their faces light up. You’re guaranteed to be asked to make a lot more, and we know you won’t turn any requests down as they are super easy and fun to put together. Setting up a nativity scene is a wonderful tradition, so this brilliant set is sure to become a regular display for many Christmases to come. Featuring intricate detailing, the individual pieces let kids share in the creative excitement in hopes that they’ll make their own in the future. Add a touch of originality to your dinner table with these six bauble-inspired coasters by Liz Ward. These easy-to-make creations will ensure you make the most of your stash oddments, and you’ll be able to create them quickly, leaving more time for baking treats guests will love. Everyone needs a crochet bear in their life, and this pattern is nothing short of cute and cuddly! Heather Gibbs has used bright-coloured yarn to jazz up her make, ensuring he stands out wherever in the home he’s placed. If you’re like us, and can’t ‘bear’ to put this amigurumi pal away after the festive season, switch up the colours on his outfit so that he can be put on display all year round! Crochet a classic bear, but dress it up in seasonal and charming gear so that it fits in with the Christmas theme. This delightful pattern features a bright red pinny and cute collar made up of half treble stitches. The bear itself uses simple double crochet stitches with traditional shaping methods that you’ll have a blast making. Let your breakfast table take centre stage with a bright tea cosy by Emma Varnam. This simple project is ideal for beginner crocheters as it involves no shaping and features only two colours. Once you’ve mastered this pattern, why not create a larger cosy with more colours? All you need to do is work more than 30 rows, and you’ll have a beautiful design in no time. Can’t get enough? We’ve got lots more Christmas crochet patterns for you to enjoy!